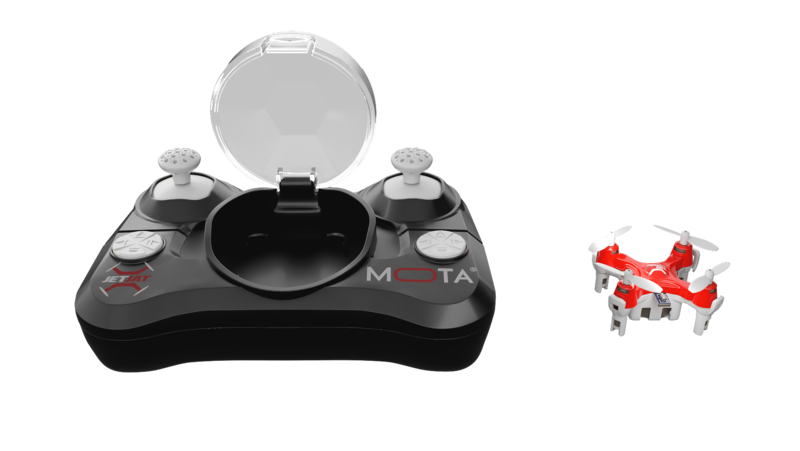 MOTA: Droning On About My New Favorite Things | "DESTROY ALL FANBOYS!" As someone new to the drone scene, I’m finding the options somewhat daunting, but have recently narrowed my selection down to what the fine folks at MOTA have to offer. As a near-total novice to the hobby, I’m currently not one for the bigger models that now need to be registered with the FAA. But the three entry-level JETJAT models I saw at Toy Fair really got me wanting to take them all for a spin. The affordable JETJAT Nano ($39.99, available now) may look like a toy, but don’t let its tiny size ( 22 x 22 x 20 mm or .87 x .87 x .79 inch) and .5 oz weight fool you. This compact cutie has four powerful motors that enable it to pull off some nice tricks with a bit of practice, allows for about 8 minutes of flight per charge and gets bonus points for fitting inside its controller. It’s also quite durable for something so tiny, but I’d keep it away from overly curious felines or other pets who pounce. The slightly larger JETJAT Nano-C (32 x 32 x 22 mm or 1.26 x 1.26 x .87 in.) is only a wee bit heavier at .6 oz and adds a 0.3 megapixel camera alone with SD card storage. This unit comes recommended for new users who want to play around with basic video capture once they get enough flight time to get the most of the approximately 4 minutes of flight per charge. Like the Nano, this one’s go quite the kick to it when you fire it up, so expect a bit of a breeze when you commit to that take-off. The MSPR on the Nano-C is $49.99 (the release date is TBA), making it an excellent and affordable starter drone for almost anyone. Finally, the JETJAT Live-W (release date also TBA) clocks in at a larger size and weight (15 x 15 x 4.5 cm or 5.9 x 5.9 x 1.8 in. and 2.5 oz), yet is still palm-sized and affordable with a $69.99 MSRP. This model offers HD video streaming, SD card storage and a controller featuring an integrated video display. As it’s a larger model, the propellers are shielded or safety and to protect them from damage. Additionally, it’s both an entry-level drone as well as a model anyone can pick up if they want to shoot their aerobatics in HD during each 5-6 minutes of flight time between charges. 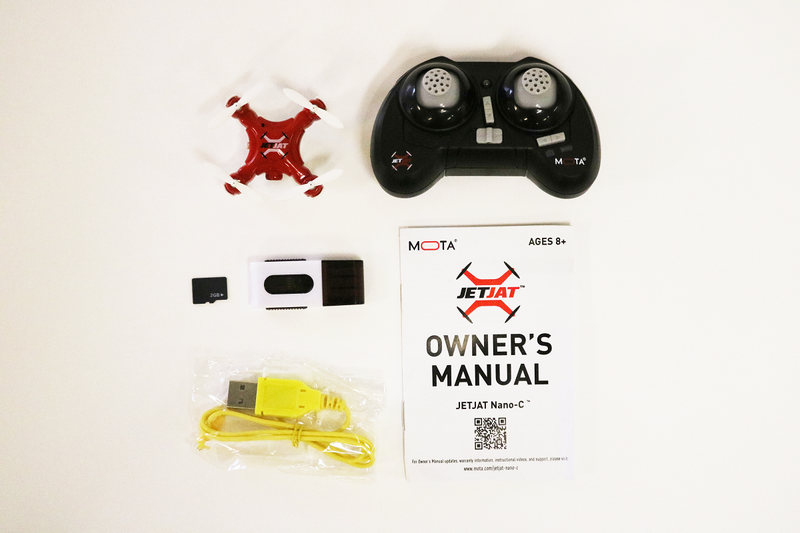 All the MOTA drones listed here (as well as the more expensive advanced models that will get covered later on) come with must-read manuals that emphasize flight safety and learning the basics before trying to whip out those pro tricks. This isn’t a hobby where you want to end up with a busted drone or some sort of too-close shave thanks to careless operation, so it’s great to see a company take even their lowest-priced models so seriously. As for me, I’m mapping out routes around the home office so I can nab one of these three drones and make the best of my free time. As I don’t have a pouncy pet hanging out around here, I think my piloting days will be free from incident unless I accidentally trim one of the plants around here when buzzing too close. 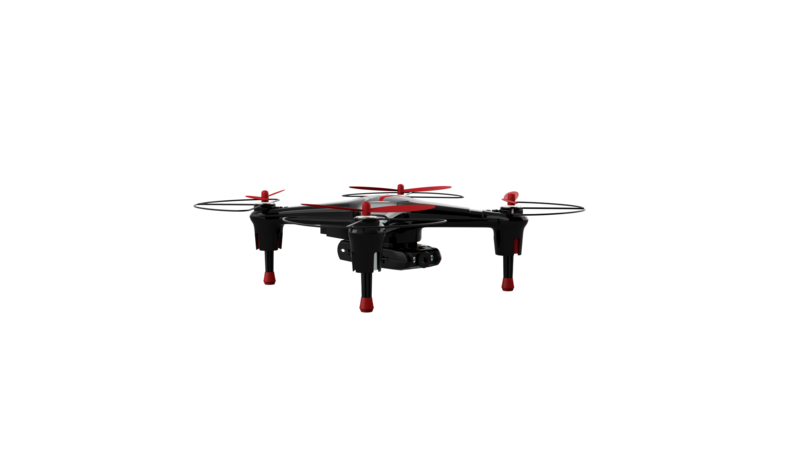 This entry was posted in 2016, Commentary, DAF, Features, Humor, Updates and tagged Buy It!, Drones, Gifts, Holiday Gift Guide 2016, JETJAT Live-W, JETJAT Nano, JETJAT Nano-C, Kids, MOTA, NY Toy Fair 2016, Ty by geelw. Bookmark the permalink.